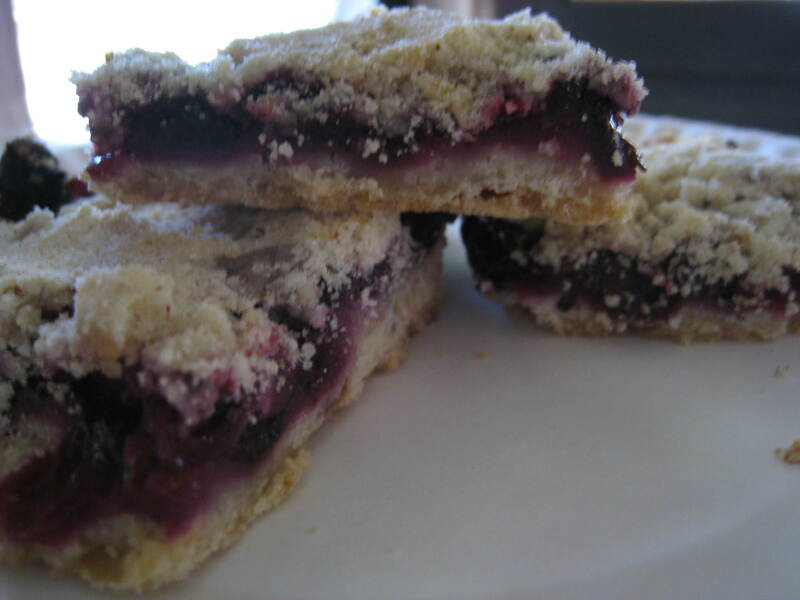 Just another blueberry bar recipe. I like my other recipe better, but maybe because this year’s crop of blueberries were super tart. I should have added more sugar to the blueberries – keep that in mind if you’re making this. Mix together the flour, 1/2 cup of the sugar, cinnamon, vanilla and milk. Cut the butter into the mix, and knead into the flour until it begins to look like coarse crumbs. Squeeze some of the mixture in your hand; it should stay intact and form a ball, but should break apart easily with your fingers. If it won’t stay together, add more butter. If it won’t come apart, add more flour. Pour 2/3rds of the mix into a greased 9×13 baking dish. Press down firmly until it forms a crust. Toss the blueberries, remaining 1/4 cup sugar and lemon juice together. Pour the berries over the crust and spread evenly along the first layer. Sprinkle the rest of the crust mixture over top and lightly press into another layer. Bake in the oven at 350ºF for 30 to 40 minutes, or until the crust begins to brown. Allow to cool before cutting into bars.